The challenge for Frank Capra with Mr. Smith Goes To Washington was that Sidney Buchman's script held within it two ideas which did not seem to make comfortable bedfellows. 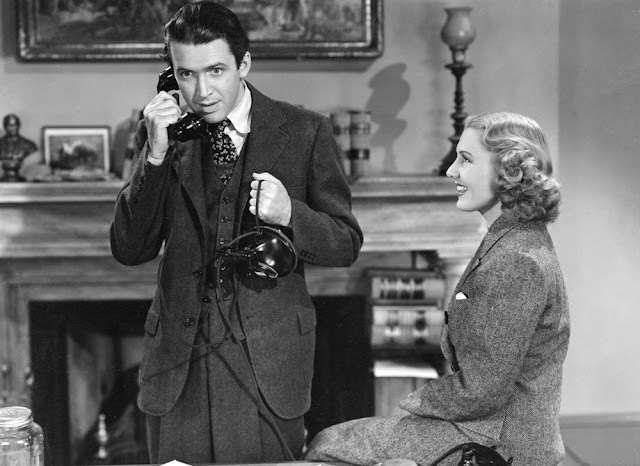 On the one hand, the film is famously and poetically admirational of US governance, liberty and the legal system, as personified by whiter-than-white congressman, Jefferson Smith (James Stewart). On the other, the film rails against the corruption and bureaucracy of government, of the degradation of the American dream and towards the lack of inspiration dished out to the young by the men who sit in office. Capra's ultimate success with the film is that he manages to imbue it with both ideals. There's a healthy lack of respect for men in power here but there's an at least equal level of devotion to the idea of government 'of the people, by the people, for the people' and the director is adamant that neither shall perish from the Earth. Capra's job at marrying the two ideas together in a non-invasive way was made easier by the cookie-cutter characters, most of whom fall on to one side of the argument or the other and never even threaten to move to the opposite side or even the middle ground. Smith is enamoured by the truth and honesty inherent in the American constitution, whilst the corrupt interpretation of it is represented by two-faced Senator Joseph Paine (Claude Rains) and Jim Taylor (Edward Arnold), a tycoon whose characterisation and influence bear more than a passing similarity to the alleged reach and influence of another media mogul, recently making the front page of many newspapers. Because these characters are so clear cut in terms of which idea they represent, the real interest in Mr. Smith is held by the characters who sway from side-to-side, primarily Clarissa Saunders (Jean Arthur). Saunders is initially presented as a disgruntled secretary who is sick of looking after ageing men with little clue of what is happening around them but quickly morphs into the smart know-all of the piece, a savvy observer of the industry she's been in for several years. Arthur handles the initial transformation magnificently and then continues to do so further into the film, as the predictable third act revelations start to change the focus onto the final scene. The other major female presence, Paine's daughter Susan (Astrid Allwyn) is sadly forgotten about just over halfway through and the chance of using her as another ambiguous character to explore is rather wasted. Although given the fairly uninteresting role of the man whose faith cannot be shaken, Stewart excels as the lead. Adept at playing the innocent hero, Stewart gives Smith the air of affability that he needs if the audience are going to get behind his ideals. It doesn't matter if we hold the same values as he does so long as we can believe in him and, eventually, believe in him we do. The key scene is the moment when Smith comes face-to-face with Taylor. As Smith starts to see that he is being asked to leave his morals behind and 'tow the company line', Stewart (a rangy 6'3") literally stands up to Arnold from the seat from which he has been receiving his lecture. It is the spark needed for Smith to transform from Boy Scout with ideals to defender of the American Way. Apart from the Susan Paine non-character, the film's main problem is the length of time it takes to deliver some of its set pieces. A scene where Saunders and newspaper reporter Diz (Thomas Mitchell, playing another intriguing character) get drunk seems not only to go for far too long but to actually go round in conversationally redundant circles. The end too, which feels like it needs the knockout punch of a killer piece of prose, instead opts to go the distance and feels less dramatic for it. It does work but Stewart standing up to the man by way of a marathon senate session doesn't have the air of a conclusion for the ages, even though much of the imagery from it still remains vivid in popular culture. I watched this for the first time several weeks ago!! I just haven't been able to write a review I have been happy with. Tried many times but delete has gotten a serious workout!! I also watched Mr Deeds Goes to Town and found that more satisfying. Many of the points you make about this are so valid. I found this followed Mr Deeds a bit too much and hence lacked a certain degree of originality. I personally loved Jean Arthur and developed a school boy crush on her from these two films!! But all the same a fine film. It is also intriguing to note this came out in 1939 with two other films you may or may not heard of ( wink wink!! ) called The Wizard of Oz and Gone With the Wind!!!!!!! 1939 wasn't a bad year considering these films are regarded as three of the best ever made! I've never seen MR DEEDS but it's definitely one that's been on the list for a while - I watched this when I was young but seeing it again now was like seeing a new film really. Definitely a vintage year!